When Ferrari unveils the new Italian supercar that will serve as the successor to the incredible Enzo later this year, people familiar with the program believe that the limited edition halo car will carry a price right around a million Euros before taxes – or $1.36 million US Dollars with the current conversion rates. The replacement for the Ferrari Enzo halo supercar is currently referred to by the company as the F150 project while rumors have suggested that the production model will be named the Ferrari F70. Whatever it is called, it will be the most powerful road going car ever offered by Ferrari and with just 499 units intended for production – owning one of those new range topping supercars will come with a serious price tag. European owners can expect to pay right around one million Euros which, by current conversion rates, would translate to a price of $1.34 million US Dollars. With a sales tax of 7%, the Ferrari F150 could cost somewhere in the area $1.433 million USD. This would not only make the Ferrari Enzo successor one of the most expensive cars in the US but it would also rank as one of the world’s most expensive supercars…ranking up there with the likes of the Lamborghini Reventon ($1.6 million USD), the Pagani Huayra ($1.3 million), the Aston Martin One-77 ($1.4 million) and the Hennessey Venom GT while still ranking well below the Bugatti Veyron Supersport that costs some $2.6 million. For comparison, when the Ferrari Enzo debuted in 2002, it cost new buyers around 665,000 Euros ($887,000 USD by current conversion rates) to get one of the 399 Enzos built but today, buying one of those supercars in the used car market will set you back over a million dollars. We should point out that the Italian automaker has not offered any official information on the production volume or pricing of the Ferrari F150 project when it meets production but a $1.3 million USD price tag doesn’t seem out of the question considering the level of performance and the amount of technology at work. When the Ferrari F150 Project becomes a production reality, it will be powered by an 800 horsepower V12 engine mated to a HY-KERS hybrid drive system that adds an addition 150 horsepower of its own for a total of 950 horsepower. Thanks to the carbon fiber chassis that was modeled after Ferrari’s race car program, the F150 Project has a very low curb weight with expected numbers to be below those of the Enzo which weighed only 3,009 pounds. This means that the F150 production supercar will likely pack 950 horsepower and weigh less than 3,000 pounds for a power to weight ratio of just 3.15 pounds per horsepower. This is 10% better than the Bugatti Veyron Supersport’s power to weight ratio of 3.42 pounds per horsepower (1,184hp, 4,052 pounds) and while the Enzo successor it “only” expected to have a top speed in the range of 220 miles per hour – it should comfortably outperform the Veyron in every category shy of flat out top speed. The F150 Project is also expected to be vastly more efficient than the either the Ferrari supercars that came before it along with any other car of comparable performance in the world thanks to the HY-KERS hybrid drive system but the more important fact is that during testing the HY-KERS system cut the elapsed time from 0-124 miles per hour from 8.5 to just 5.5 seconds. Yeah….Wow is right. The bad news for those millionaires who are sitting at home, reading this and calling their accountant to transfer $1.34 million from an off-shore account into the US to buy a new Ferrari F150 is that Fiat SpA CEO Sergio Marchionne has stated that the new halo supercar is already sold out. The company has reportedly been showing off the F150 Project behind closed doors to a very select group of individuals who likely don’t think twice about spending over a million dollars on a sports car and Mr. Marchionne’s comments would lead us to believe that those private viewings have gone very well if they have already sold 499 Ferraris with a price tag of $1.34 million USD. 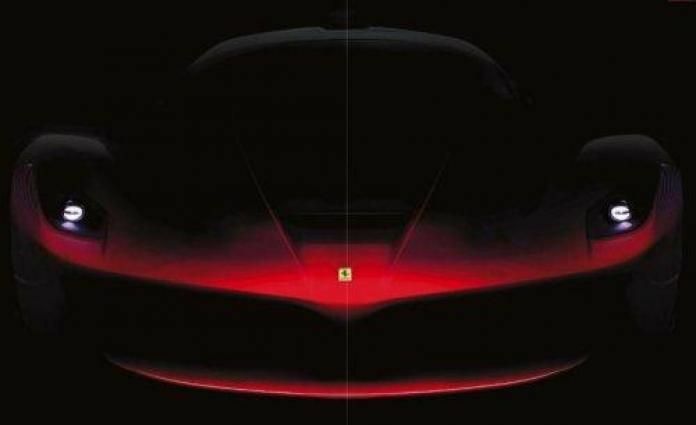 The Ferrari F150 Project is expected to make its grand debut at the upcoming 2013 Geneva Motor Show on March 5th…which is also the same day that Lamborghini will introduce their new supercar that is expected to be the highest performance model in the company’s history. The battle between Lamborghini and Ferrari is heating up thanks to a pair of new ultra high performance halo supercars and that is very good news for those of us who enjoy lusting over cars that we will likely never be able to afford. Great! but while I agree that this will be good for us car-lovers, dont forget about the pagani new model/special package to be unveiled at the same time as well as the Spyker concept, and the rolls royce wraith. Elsewhere it has been stated that the lamborghini reveal MAY BE the Urus.